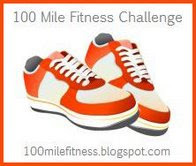 Trish of Trish's Reading Nook has started a 100-mile fitness challenge. I am publicly stating that I will walk at least 100 miles between now and the end of the year. For full rules and for how to join, check out her 100-Mile Fitness Challenge blog. My big tip: Audiobooks are your friend! I love to read while I walk. Imagine me walking with you. You'll finish this in no time! This is a great challenge. I should really join. It would probably be the only one that I actually finish. Very cool! I should do that too! I'm going to check it out! Did you hear me say "I'm not joining any more challenges!" ?!? Well, I was talking about reading challenges; this I'd love to do. Look for the widget on my blog ... thanks for the inspiration. I love to walk and listen to audio books! Way to go! I'll cheer you on if you keep us updated on your progress. Monkey see, monkey do once again - I'm going to have to go join this one too! I need to get moving! I'm so jealous! I want to join this challenge but still not up to workout mode with my fractured heel. boohoo. I walked last Tuesday...30 min...and my heel hurt non-stop through Saturday. Since I'll be working on getting myself back to where I'm able to walk and run...I'll be working out but not enough that I can complete this. So that means...I'm cheering you on! You'll just have to walk for me since I can't! Yes, audiobooks are my best friends for this challenge - and then what happens? I start today, and halfway through my treadmill session, my iPod dies on me! (turned out I'd forgotten to charge it the past few nights) So, the first half of the session was easy(ier) and the last half was, uh, not very enjoyable! Hi Beth, I'll be doing this too! Earlier this year I started a challenge to walk 10,000 steps a day which for me is about 6kms per day (about 4 miles I think). I did really well while the challenge was going then slipped off a bit when it officially finished but have recently decided to re-comit to the 10,000 steps even though everyone else I did the challenge with says no. And I agree - audio books make all the difference (I also listen to some free podcasts as I can't afford enough audio books to keep me walking). I love your tip about audiobooks! That might make a difference for me.